For many, it is the quintessential sound of summer. It will focus the collective attention of 40,000 fans in a split second. 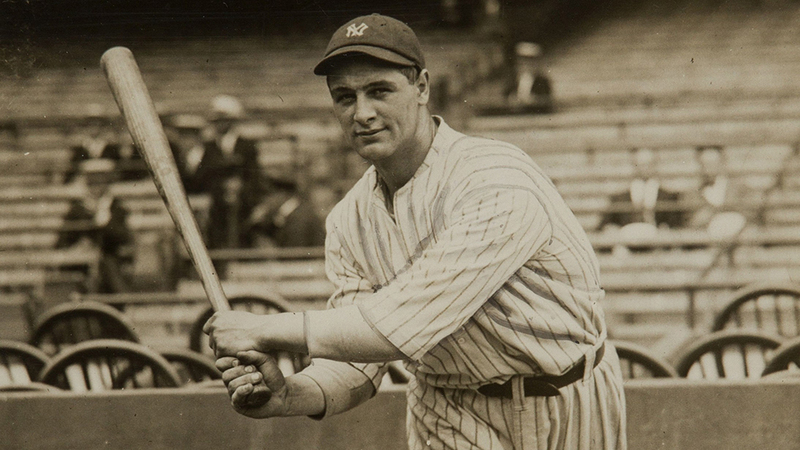 That distinctive reverberation, the crack of the bat, has been around as long as baseball. Yet as far as I know, the physics of the crack of the bat have only been described theoretically once, and experimental data are rare. Many fans, as well as players, will tell you a well-hit homer sounds distinctly different from a lazy fly ball. Coaches claim they can estimate the potential of a young hitter just by the sound created when his bat meets the ball. To shed light on such claims, a friend and I headed to Phoenix for spring training in 2014. What follows is a summary of the theory behind the crack of the bat as well as a discussion of our measurements. In 2001, Robert Adair — renowned for The Physics of Baseball — was asked to speak on acoustics and baseball. He claimed to know “nothing of acoustics” but thoroughly explained what little theory we now have regarding the crack of the bat. His argument suggests the sound has two sources: the expulsion of air as the ball and bat collide, and the vibration of the bat after the collision is complete. He estimates the contributions from the two are about the same size. More remarkable from my point of view, both create sounds loud enough to be heard throughout a ballpark filled with 40,000 fans. Sound is created when air is driven out of one space and into another. The simplest example is clapping your hands. As your hands approach each other, the air in between is forced out, creating sound waves. When you bring your hands together slowly, you create a lower frequency sound compared to bringing them together rapidly. Try it. The collision time for your hands determines the frequency of the resulting sound. The same is true for the ball-bat collision. 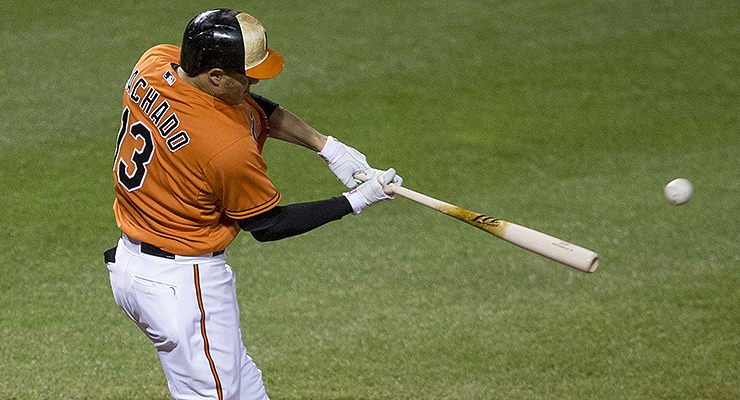 The collision time between the ball and the bat is about 0.6 milliseconds (ms) for a well-hit ball. Lucky for you, I won’t go into the details of the theory of waves. 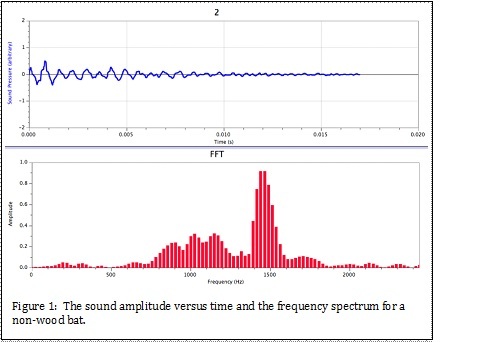 However, it turns out that you can expect a broad collection of frequencies centered about the reciprocal of the collision time, about 1.7 kilohertz (kHz). For a poorly hit ball, the collision time is generally longer, resulting in a collection of frequencies centered at a lower frequency. This frequency shift is a potential source of the difference in sound for a homer versus a weak ground ball. The sound associated with the vibration of the bat is analogous to the sounds created by the vibrating strings of a guitar. When you pluck the top string, you primarily hear 82Hz. In addition, you’ll also hear – in decreasing volumes – 164 hertz (Hz), 246Hz, 328Hz, etc. These are often called the “natural frequencies” of the string. The first four natural frequencies for a bat are known to be around 170Hz, 600Hz, 1200Hz and 2000Hz, though they vary a bit from bat to bat. For a well-hit ball, there should be relatively little excitation of these vibrational modes because they all have nodes near where a well-hit ball strikes the bat. However, for a less well-hit ball striking the end of the bat, these modes are excited to varying extents. 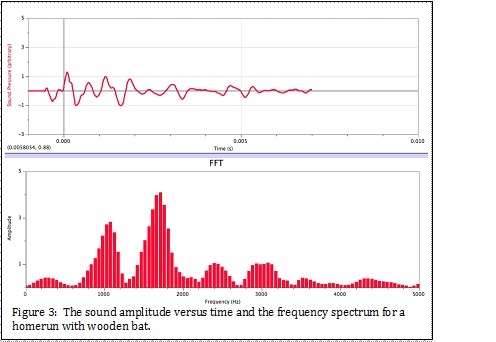 In summary, Adair’s theory predicts a broad group of frequencies centered at the inverse of the collision time, plus contributions from the natural vibration frequencies of the bat. For a well-hit ball, the group of frequencies should be a bit higher, and there should be little contribution from the natural frequencies of the bat. For a poorly hit ball, the group of frequencies should be a bit lower, and there should be some contribution from the natural frequencies of the bat. David and Christine Vernier of Vernier Software and Technology provided us with a MCA-BTA microphone connected to a LabQuest Mini (LQ-MINI) interface that we connected to our laptop. We used Logger Pro software to record the microphone trace for hundreds of ball-bat collisions from safely outside the fence behind home plate. The accompanying software produced the frequency spectrum. To prepare for our trip to spring training, coach Dave Taylor was kind enough to give us permission to collect some preliminary data from the California State University, Chico baseball team during their batting practice. They use non-wood bats. In this environment, the “crack of the bat” is replaced by “ping of the bat.” Figure 1 shows typical data. The collision can be distinguished within the first millisecond in the upper curve. The rest of the graph is due to the vibration of the bat. There is a broad band from around 800Hz to around 1800Hz from the collision. Superimposed upon the broad band is a sharp peak a little below 1500Hz that is the dominant frequency in the ringing or the ping of the bat. While analyzing the ping of the bat was a good exercise, we were curious if the data from the crack of the bat would be significantly different. We were very fortunate to obtain permission from Steve Decker of the San Francisco Giants to place a microphone 30 feet directly behind home plate for three spring training games at their Triple-A facility in Scottsdale, Ariz. Since there was no seating for fans at these games, the sound environment was reasonably quiet. We collected data for over 150 ball-bat collisions. We recorded the first seven milliseconds of the crack of the bat. This choice was necessitated because it was the only way to get the software to produce a frequency spectrum at 50Hz intervals. The microphone was still picking up sound at this time, presumably from the vibration of the bat. For each collision, we noted the outcome of the hit and made a qualitative judgment as to how well the ball was hit on a scale of one to five. Let me begin with the bad news. Our data is less than conclusive. On the bright side, it doesn’t clearly contradict Adair’s theory. Figures 2 and 3 are the data from two different home runs. The upper curve is the amplitude of the sounds versus time. The lower curves are the frequency distributions in the upper curve. In the upper trace of Figure 2, the sound due to the expulsion of the air during the collision clearly can be seen within the first half millisecond or so. However, this is less clear in Figure 3. This could be because the sound in Figure 2 is louder than Figure 3. Both spectra have substantial high-frequency components. It is unlikely they are due to bat vibrations. They might be artifacts of the method by which the software calculates the frequency graph; we simply don’t have sufficient evidence to say for sure. 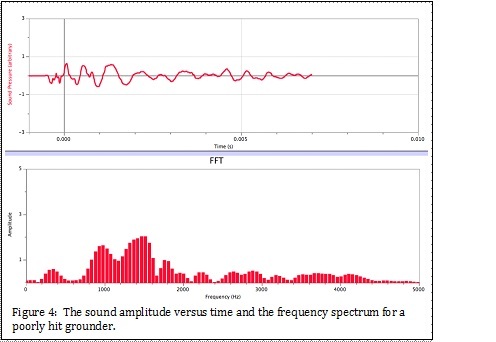 The spectra both have a band of frequencies centered around 1700Hz, as predicted. They also both contain a small band centered around 300Hz that might be the fundamental vibration of the bat, and a stronger peak around 1000Hz that could be from a higher frequency mode. Figure 4 is from a poorly hit ground ball. The frequency spectrum has peaks around 300Hz and 1000Hz like the homers. While the home runs have a band around 1700Hz, this poorly hit ball has a band centered lower at 1500Hz. This could be caused by a longer collision time, as we predicted. The relative height of the 1500Hz band compared to the two lower frequency peaks is smaller than the relative height of the 1700Hz band in the homers. If these bands are due to the air expulsion, it would indicate that the poorly hit ball deposited more energy into the vibration of the bat, as one might expect. In summary, the data we have collected using readily available, off-the-shelf equipment is less than conclusive. Nonetheless, it does demonstrate aspects of Adair’s theory. In the future we hope to repeat the experiment with more sophisticated sound equipment. Another layer of sophistication would come from being able to use Statcast data, in order to better quantify how well a given ball was hit. Finally, it would help if we could measure the natural frequencies of the bats before we collect data. “So much to do, so little time,” said Jeremy the Nowhere Man. Special thanks to Scott Gimbal, a CSU Chico physics major, who collected the data from the Chico baseball team batting practices, and to Paul Robinson, who helped with data collection in Phoenix. Special thanks to the Vermier’s for use of their equipment, and to CSU Chico and the San Francisco Giants for allowing us to record at their facilities. 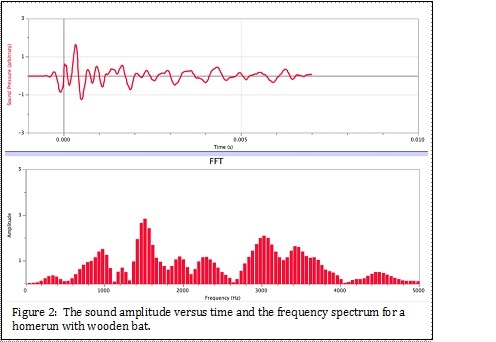 Robert K. Adair, Acoustical Society of America, “The crack‐of‐the‐bat: The acoustics of the bat hitting the ball,” J. Acoust. Soc. Am. 109 , 2497 (2001). Seems odd to not reference this almost-2-year-old article which overlaps a lot with this study. As a physics professor, you should know what a “literature review” is. My apologies. I had read your article as I was working out the logistics of collecting our data. Unfortunately, my memory failed me and I am glad you rectified the situation by including a link here. For the record, that commenter is not the author of the BP article (that would be me). I very much enjoyed your piece, David. Interesting work. I’d love to see more/more precise data. Also, any chance you can make those graphics a little bigger?